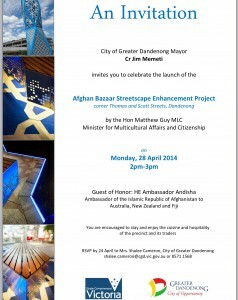 The Afghan Bazaar Cultural Precinct in Thomas St Dandenong has a fresh new look. Stage 1 of the Streetscape Enhancement Project, jointly funded by the Office of Multicultural Affairs & Citizenship and the City of Greater Dandenong, is now complete. 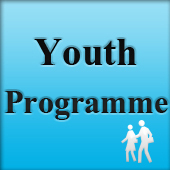 On Monday, 28 April the project will be officially launched at 2pm by the Minister for Multicultural Affairs and Citizenship the Hon Matthew Guy MLC. He will be joined by Greater Dandenong Mayor Jim Memeti and the Ambassador of the Islamic Republic of Afghanistan to Australia, New Zealand and Fiji, His Excellency Ambassador Andisha. Changes include new and more effective street lighting, the removal of overhead powerlines, expanded footpaths with patterned paving, new seating with decorative lighting, trees, plants and landscaping. A highly integrated artwork called ‘The Lamp’ has also been installed on the corner of Thomas and Scott streets as a distinctive marker for the precinct. The base features blue mosaic tiling, referencing the high value Afghan communities place on traditional arts and culture. The top section incorporates a complex lattice weave that allows light to filter through. It represents all cultures and backgrounds of the people who call Australia home and is a symbol of freedom, peace, love and respect.